After twice dumping my purse out in the floorboard of my truck, I whined that I needed to get a bit different (read: bigger) purse, and one that has a firm, flat bottom (not always a desirable trait, but in a purse — ok). But as usual, I didn’t do anything about it. My Cowboy, though, hears every complaint I make, and knows that I won’t do anything about it, so he does it for me. This only reinforces my whining. If I need something that I don’t want to do for myself, I just whine a little, and he’ll take care of it. Yes, I’m spoiled. And this is probably not a good thing! Look what arrived in yesterday’s mail! Cowgirls! And it’s Kate Spade, no less! And it’s got a firm, flat bottom! No spills! I promptly switched all my necessaries over to it, and as we were headed to town last night, I was holding it on my lap admiring it. I have to be the most gullible person on the planet! Would YOU have fallen for a story like that? But at least I get to keep the purse, and can take comfort in the fact that it did not come to be mine because some poor woman died in a tragic accident. And today, I’m headed out to Springfield, Missouri, in the rain, to see the Ozark Piecemakers Quilt Show. I plan to meet up with my friend, Bari, and see my friend, Lori East, while I’m there. My Cowboy’s with me, so maybe I’ll collect some stories and quotes for you (if they’re repeatable in polite company) . . . If you will be in Springfield, too, and run into me, stop me and say hello. 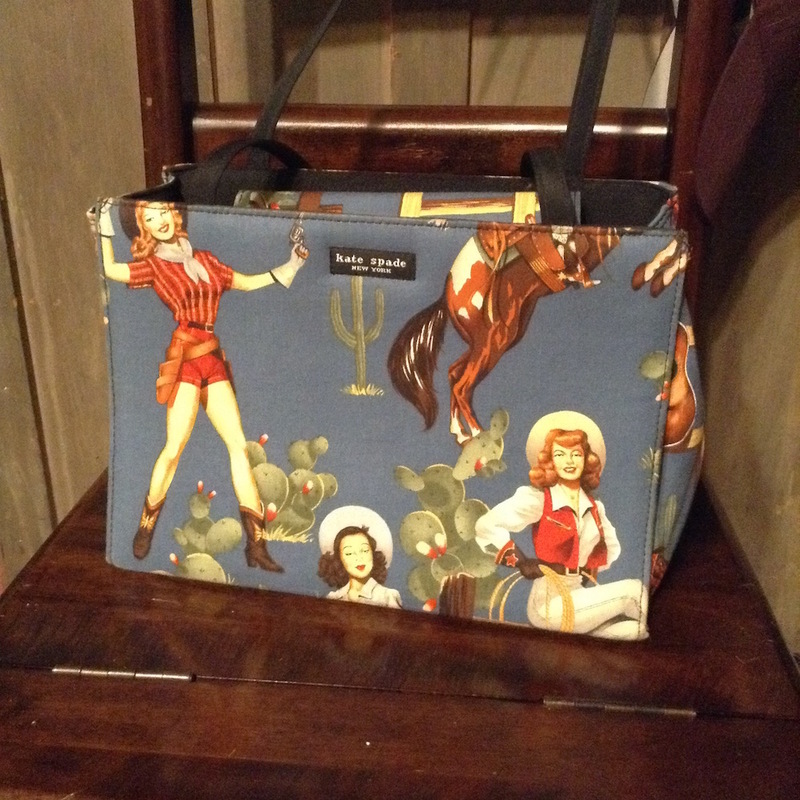 I’ll be the girl carrying the Kate Spade Cowgirl purse! we’re rolling on the floor laughing…thanks for starting are day out great! Can’t wait to see you!! And yes, meet that very ornery Cowboy…I gotta congratulate him for picking out a GREAT purse (and maybe give him a smack for torturing you). Have fun and tell Lori hello! Great purse!!! Oh my goodness — you had both my husband and I laughing out loud (mine would do something like this, and I would be as gullible as you). Have fun at the quilt show, and say hi to Lori for me! LOL – sounds just like your cowboy. Have fun at the show and with your friends. Nice purse by the way. Be cautious…Lov the bag and your cowboys story. Oh my gosh! This is so me and my “cowboy”, but in his case, he wouldn’t have told me until a week or two later. I am so happy to hear that I am not the only one this gullible! I believe everything he tells me, because why would he lie to me? I don’t always think it’s funny when he finally does tell me, but with your story, I was laughing so hard, I could hardly read it to him. Thanks for sharing. Great bag – better story!! I can’t think what in the world he could say next. Oh, and I like the purse a lot. Spent the day at the quilt show yesterday and shopped til we dropped today. Eight of us from the Sitch by Stitch Guild had a great time. Hope you enjoyed your day. Cute purse! No, I can’t believe you’re that gullible! Sounds like he is a keeper after all.